A water colour depicting a dock scene and cargo handling for a large ocean going ship. 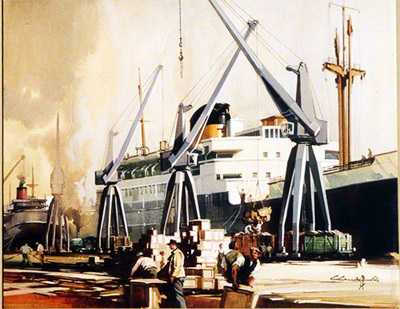 Claude Buckle in his painting captures the scene in the docks of a large ocean going ship and cargo handling. The ship is also a passenger carrying and is probably a ferry. In the foreground men are working on moving wooden crates from a large pile. The scene is early 50’s so very different from today’s container ports. The medium is pastel and water colour. Created in 1951.